In Weiss Bräu, a cool brewpub in Cologne, I ordered a beer, sat back and took out my notebook and pencil to write some stuff down: behind me was a large table of students, happy, celebrating something; a businessman sat alone in front of me drinking a wheat beer and eating chips; two chaps shared a huge pizza to my right; and relaxing all around were couples sat in booths eating and drinking. But one of those couples freaked me out. He was necking small glasses of kolsch as if he hadn’t had a drink for a week, which was easily done because the beer was very good – served in the wiess style, it was unfiltered (meaning it technically doesn’t count as a kolsch according to the Convention). 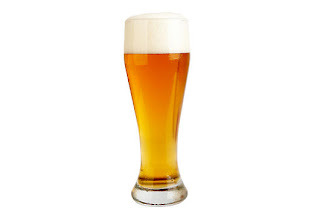 She was drinking a pint of wheat beer; a large vase glass, hazy amber with a thick foam. She was also very heavily pregnant. Like beach-ball-under-a-vest pregnant. I’m pretty sure I did one of those comedy double takes followed by my eyes bulging out of my head and my chin hitting the table. She was drinking as fast as he was and soon her half-litre was gone and she ordered another. I couldn’t believe it and I didn’t know how to react: Is this behaviour ok in Germany? Is she crazy? Why is no one doing anything? I watched the server return to the bar and pour another kolsch for the guy and grab a bottle from the fridge for the girl, meaning she wasn’t drinking the draft hefeweizen (probably for the best as I thought it tasted like toilet cleaner because of a massively oppressive clove dominance). I checked the menu to see what it could be and the only bottle on there was enough to calm my frantic thoughts: it was an alcohol-free hefeweizen. Brow mopped and sigh exhaled, I could now go back to my beer free of worries. In every bar in Germany you’ll find an alcohol-free beer option. It’s typically a wheat beer, though not always, and many are good drinks, certainly valid replacements for someone who doesn’t fancy water or lemonade (plus in German bars, where they think differently about these drinks to Britain, it's probably more acceptable for an adult to have an alcohol-free beer than a soft drink). But I was thinking about the social appropriateness of alcohol-free beer, not the taste. What if the person sitting next to you at work opened a bottle of alcohol-free beer at their desk. It’s in a glass bottle and looks exactly the same as an alcoholic version, only it’s not going to get you drunk. Would the boss look upon them and their bottle suspiciously? Would they wonder what was going on? On seeing that it was alcohol-free would they mind it being drunk or would they be concerned? If my colleague opened a bottle and drank it at their desk, I’d wonder what was going on in a reaction that would be very different to them opening a Red Bull, Coke or even one of those old school cans of Shandy, even though they are all non-alcoholic drinks (the 0.5% ABV in the shandy can probably be overlooked...). My questions are more rhetorical than direct; I’m throwing out my thoughts because I’m still unsure about them. The thing is, it looks just like beer and is, in a way, a pseudo-beer, something to make you think you’ve got a delicious, intoxicating drink when in fact it’s just a taste-a-like. So is an alcohol-free ‘beer’ a drink you can open at any time? Could you have it with breakfast (or before), in a meeting at work, during a game of football or should it be kept in the same situations as alcoholic beer and therefore does it come attached to beer’s social prejudices? And what about seeing a pregnant woman drinking it: ok or unnerving? Quite a few breweries here are marketing alcohol-free beer (particularly Weizen) as an isotonic sports drink. It's perfectly normal for people to order them in a pub when driving, and they'll lash into them. But I've never seen a colleague drinking one in the office (at least while working), and I guess Malzbier doesn't count, as it's just a malt "beverage". The different attitudes are probably subtext to this piece, which is what I find interesting. I can also see how it could be seen as an isotonic drink - it's got carbs, sweetness, it's refreshing... I'm running a marathon in about 10 days so maybe I'll replace my usual isotonic drink with something different! As for Sweden, 2.25 % beers - known as "Lättöl" (light beers) are accepted at all times, occasions and drinkers (although probably not kids or pregnant women). Those pale lagers (a few wienna lagers exists too) are had at hospitals, prisons, Mc Donald's, workplace canteens and hot-dog stands, especially as part of the hot lunch. Interesting! I suppose there's a whole side discussion about drinking beer over lunch when at work, as well... 10 years ago when I first started working in an office it was fine for someone to go to the pub at lunchtime for a pint or two. Now it doesn't seem that way (though many people still do it, no doubt). I don't understand your reaction. When I think of alcohol-free beer I think of awful things like Kaliber and Barbican - the kind of thing you wouldn't drink unless you were avoiding beer for health reasons and really missing it. I think AFBs still have those associations in this country - the discomfort I'd feel if I saw somebody drinking one in non-beery circumstances would derive from my assumption that they must be a borderline alcoholic. But if you've got a good reason for avoiding alcohol (e.g. pregnancy) and (what sounds like) a really nice AFB, what's the problem? Kaliber is really awful but many of the ones I've tasted are pretty good - drinks you would buy because you like how they taste and not out of some kind of desperate attempt to drink beer without the booze. We think of them very differently in the UK to Germany and yes, the borderline alcoholic thing crossed my mind as well - are they drinking this because they're desperate for the taste of beer? As for not understanding my reaction... Regardless of how these taste, what if your colleague opened a bottle sitting next to you at work? What if a 10-year-old kid was sitting next to you on the bus drinking one? What if you passed someone driving their car and drinking a bottle of alcohol-free beer? Surely there'd be some reaction from you in those circumstances? I think the two things that count are the quality of the beer & the setting. If I saw anyone drinking Kaliber, in any situation, I'd assume they were on the wagon and desperate, and the other reactions ("and we're at work/she's pregnant/he's driving") would just build on top of that. A decent AFB, not so much. Then there's setting, which matters for beer - and I think alcohol-free beer is no exception. There are times and places where it's normal & acceptable to drink beer, and times and places where it isn't. Drinking AFB in a 'normal' setting for beer says "I'd like to join you guys but I can't" (for whatever reason - pregnancy being a good one). Drinking AFB in an abnormal setting would stand out - you might look like a trend-setter, you might look obnoxious (I think you'll find that alcoholic beverages are banned on company premises, and this isn't an alcoholic beverage...), but either way you'd stand out. I guess I don't think "drinker is heavily pregnant" changes the setting in that way. Also illustrates how pregnant women drinking any alcohol has become taboo, even though there is no medical requirement for total abstention. A few units a week won't do you (or the baby) any harm; it's also true that most of us can drive safely and legally on a pint or even two. Moderation is true temperance, as it says in Yates's. But I'm afraid that ship sailed some time ago. I was drinking a pint a day with lunch (and three on Friday) as recently as 1998. I took a few years off salaried employment at that point, and when I went back the world had changed. Interesting one. Personally, I think they serve a purpose - as in your pregnant girl, designated driver etc - but to have one for breakfast or at work - i think that's a little worrying. There's something about 'needing' or 'wanting' a beer when you shouldn't that concerns me. Feels a little...wrong. You know? I returned from Spain yesterday where the non-alcoholic beer market is one of (if not the biggest) in Europe, every bar has an alcohol free option, often in draft and in bottle. We ended up drinking it a lot, partly as I was the designated driver, partly because my wife is pregnant (she drank them too!). But the other reason is, when the main purpose of the beer is to cool and refresh rather than savour, the alcohol seemed somewhat surplus requirements. I don't particularly like soft drinks and I get through 2 litres of water a day anyway, so I need something a bit different, a zero degree San Miguel 0% hits the spot nicely! As to your question about acceptability, to the Spaniards it seemed acceptable to many different types of people, at all times of the day, in all company. We may mock but it certainly seems to have invigorated the beer market over there. Very interesting post. Well. Drinking has been a social lifestyle for man and there has also been too many issues concerning drinking excessively that loses one's conduct in a public or social state. Somehow, drinking alcohol made great changes in one's life making us realize the sense of putting limitations to whatever we do.